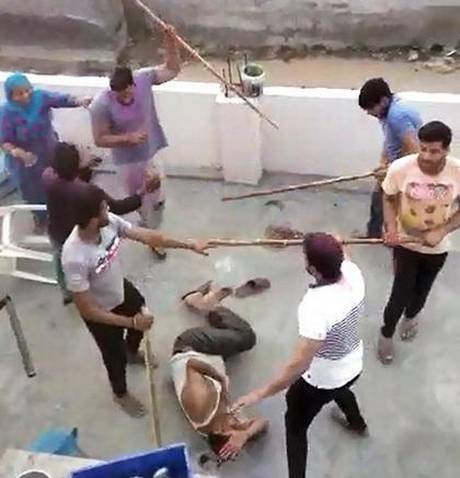 The family alleged that they were approached by men who used communal slurs and later assaulted them with sticks and rods. New Delhi: A group of assailants attacked members of a Muslim family and their guests at their home in Gurgaon’s Dhamaspur village on Thursday, according to a report in the Indian Express. According to the FIR, the incident took place around 5 pm, at the home of Mohammad Sajid, after some of the accused men allegedly approached the boys from the family, who were playing cricket, and demanded that they “go to Pakistan and play”. Dilshaad said in the police complaint that after his uncle Sajid intervened, the men allegedly slapped him and left. Afterwards, they saw six men on two bikes and several men on foot approaching their home, armed with bhalas, lathis and talwars. The mob allegedly assaulted the men, vandalised the house and fled with the valuables. The women and children were sent up to the second-floor terrace, from where, one of the girls, Danishta (21), shot the video of the assault, that has now gone viral on social media, showing the assailants beating up the men and an elderly woman while the girls and boys on the second floor attempted to prevent the terrace door from opening. A Gurugram police spokesperson, Subhash Boken, however, told the Hindu, that the scuffle broke out between the two groups over a cricket match on the same ground and claimed that there was no communal angle to it. An FIR in connection with the case has been registered and one person was arrested on Friday night. The police have said that a case has been registered under IPC sections 148 (rioting), 149 (unlawful assembly), 307 (attempt to murder), 323 (voluntarily causing hurt), 427 (mischief causing damage to the amount of fifty rupees), 452 (house trespass), and 506 (criminal intimidation). “Some of the accused have been identified. We are conducting raids and expect to make arrests soon,” inspector Surender Kumar, SHO of Bhondsi police station told the Indian Express. The Congress lashed out at the BJP government in Haryana after the attack, asking how it happened under the watch of so many ‘chowkidars’.